Welcome to the inaugural post of my 2006 Peregrine Falcon monitoring journal! I could not be more excited!! I am Stephanie Ware – a research assistant in the Bird Division of the Zoology Department at the Field Museum in Chicago, IL. 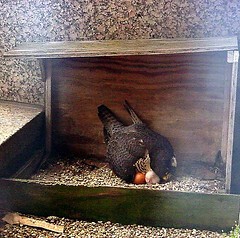 In the 1960’s, the American Peregrine Falcon (Falco peregrinus anatum) had disappeared from the Midwest due to the use of DDT (a pesticide used by farmers), which caused egg shells to thin so much that they could not support the weight of the growing chick inside and broke before the chick fully developed. In the early 70’s, the government banned the use of DDT and Peregrines were placed on the Federal Endangered Species List. The Chicago Peregrine Program joined other groups in 1985 who dedicated themselves to reintroducing this beautiful bird into the Midwest. From 1986-1990, they released 46 birds with the hopes that they’d come back to Illinois to nest. Populations began to rise and the program shifted its efforts from releasing birds to monitoring nesting pairs. In August of 1999, the Peregrine Falcon was removed from the Federal Endangered and Threatened Species List, but the state of Illinois still classifies its population as threatened. Peregrine Falcons naturally nest on cliff faces. 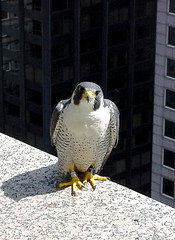 The skyscraper is a city’s answer to cliffs and some of the reintroduced Peregrines began nesting in the niches and on the ledges of a few Chicago buildings beginning in 1988. By 2004, Chicago happily hosted 13 successfully breeding pairs. I’ve been very interested in the activities of Mary and her group for some time now and believe strongly in what they are doing. So, I was shocked and amazed when Mary came in to my office last week and invited me to go view a pair of peregrines nesting in Pilsen. I jumped at the chance! At then end of the trip, she asked if I’d like to volunteer some of my time to help the cause. Of course!! So, she pointed me towards a pair that nests just 2 blocks from my house, on the side of the Metropolitan Correctional Center (a maximum-security prison). The next week, I took my camera with me to work every day in anticipation and today was the day. First we checked on the pair that nests on the top floor of University of Illinois at Chicago’s University Hall. They had 4 eggs, but no hatchlings. Next, we went to a skyscraper on South Wacker Drive. In 1988, this building had the honor of hosting the first pair of nesting falcons since 1951 – a male named Jingles and a female named Harriet. They returned every year to nest until, in 1997, a new male moved into the territory. His name was Hubert. Hubert and his mate, Dory, nested there until 2004. Hubert died that year shortly after his last chick hatched. He was an astounding 18 years old, which is farily long-lived, since the maximum longevity records for banded peregrines ranges from 16-20 years. Dory died the following winter. The building decided to undertake a renovation at that time. In a very cool move, they built an access door for Mary that led to the ledge. Before that, the banding team had to go down on ropes from the roof. 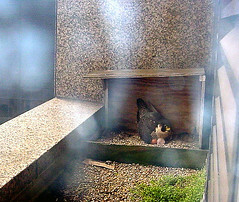 Mary said that she was tickled a pair was nesting there this year because one can never be sure if a new pair of peregrines will inhabit an old nest ledge. The building manager met us at his office and we followed him to the up a series of stairs and turns. Finally, we came to the access room, which housed a lot of huge heating and cooling machines for the building. Mary knelt down and carefully opened a small trap door in the eastern wall. Years ago, when the falcons started nesting on this ledge, the program installed a nesting box on the far southeastern corner of the building. Mary motioned for me to come over. I knelt next to her and looked south, down the ledge. There, in the nesting box, sat the female. She hunkered over her nest, staring at us suspiciously. We could see the edge of one egg, but nothing else. After awhile, the female calmed and settled back down on the eggs. She shifted around and, ‘lo and behold! A fuzzy, puffy, tiny day-old chick appeared. How cool! I could have watched the female forever. What an impressive bird. She didn’t take her eyes off me for a second as I slowly contorted myself in order to try for a clear picture. After awhile, the restless chick moved out from under her revealing another chick! Mary thought she probably had another egg under her as well – 2 chicks, 2 soon-to-hatch eggs. Finally, she took her eyes off me long enough to secure the chicks back underneath her. Here’s a close-up view of that chick. As I took pictures of the female with her chicks, I heard a soft noise behind me. Slowly, I turned. Less than a foot behind me, the male perched on the ledge and his eyes were boring holes in my back. He opened his beak and let out a squawk but didn’t move any closer. I snapped his picture quickly and pulled myself slowly inside. Mary and I stayed awhile longer, trying to get a better view of the chicks. The male stayed on the ledge the entire time, staring at us. As Mary took her turn out the door, I reviewed my pictures. Pay dirt! A leg band! If you click on the picture to the right, you can see them quite clearly. On the right leg, he has a silver band, which is USFWS or the Canadian counterpart. That band has a long series of numbers almost impossible to read if you aren’t holding the thing in your hand. The silver band denotes a Canadian bird. Midwestern wild-born birds have a purple USFWS band. A raised and released (hacked) bird from the Midwest has a gold band. On the left leg, you can see two bands, both black. The top one has a “7” on it and the bottom one has a “6” on it. This is an individual ID tag and the colors again indicate a Canadian bird. Midwestern birds have black over green or black over red. So, I need this information for the prison birds. I, honestly, find it hard to see the information when the bird is less than one foot from me, much less 50 feet, on a light post, feeding on a starling. How challenging is that?!? I’m so excited! ~ by Steph on May 4, 2006.